May 2018 marks the 15th year of development of HighDesign. When it was introduced, HighDesign was a light-weight CAD tool intended to assist professional designers in their every day tasks. It ran natively on the relatively new Mac OS X as well as OS 9 and featured the fundamental drafting tools plus a couple of more specialised functions like walls, windows and photogrammetry. When we presented it at the Apple Expo Paris it was indeed very well received as a much needed, modern CAD software for the Mac platform. Fast forwarding to today, HighDesign is now used in more than 60 countries around the world, mostly by architects, engineers and constructors (AEC) who make more than 80% of the total users. The 2017 release introduced the LT edition, beta support for the Windows 10 platform, textures, columns with auto alignment, a redesigned Annotation tool. Our focus is on the AEC industry fields. These are the disciplines that give the present world a visible shape, and as the world has been changing fast, so has the practice of AEC professionals. HighDesign is getting ready for the new scenarios that will dominate the industry in the next decades. The big word in today’s AEC world is BIM, which means Building Information Modeling. A BIM project is a digital representation of a building or facility, with all its physical and functional elements and the information associated to those elements. It is not just “a 3D model”, but a process that blends the idea of simulation with multi-disciplinary interoperability where the media being exchanged are information rather than drawings. To put simply, where CAD would begin with the drawings, optionally create a 3D model out of those drawings and eventually attach data such as schedules and reports to the final project, BIM would begin with the model, whose elements include and are constrained by information, and then produce the construction drawings. 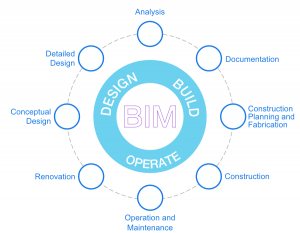 A BIM project is usually said to be 4D as its life does not end with construction, but continues to be used in the operation and maintenance of the building. In recent years, BIM has become the preferred design process because of its ability to improve efficiency and cut waste of time, resources and materials. A number of countries have passed legislations that will eventually enforce the adoption of BIM tools for public-financed projects. Does BIM mean the extinction of CAD? Not at all. CAD will continue to play an important role in the designer’s workflow. It will have to evolve and be able to integrate in the larger BIM process, and HighDesign has been doing just that. Our work in the past three years of development has all been in this direction: the evolution of HighDesign from a pure CAD software to a larger CAD+BIM eco-system. Though some things had to be redesigned, there was no need to reinvent the program. In fact, the major changes were relatively few because since its conception in version 1.0 HighDesign has always integrated concepts that are more familiar to BIM rather than to CAD. To us, it really feels like the most natural evolution. The road towards BIM will be progressive and will see HighDesign Pro as a bridge between traditional CAD (LT, Standard) and the BIM workflow offered by a new product in the HighDesign line. Some changes will appear gradually in the Pro edition and others will appear with the introduction of a new HighDesign Architect that will provide 3D modeling, IFC support, COBie, element properties, and more. So, at the beginning of 2019 the HighDesign line will feature pure CAD products, an advanced architectural CAD (Pro) and a product designed for BIM. The editions of HighDesign: pure CAD, advanced architectural CAD, BIM. All editions will share the same file format and will be able to interoperate transparently, both on macOS and Windows. Since version 2016 HighDesign has been following this path, with the most changes still hidden in the internal engine and program structure. In 2017 some features became visible, like the auto alignment of columns, the improvements to annotations and the reorganisation of the tools in Drafting, Documentation and Design groups. Those and many other little changes are all part of this evolution. The next update will more clearly display the work we have done so far on the road to BIM. 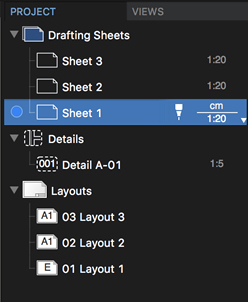 In HighDesign Pro, the Sheets panel is being replaced by a Project panel that lists the sheets and other project items organised by function: Drafting Sheets, Details and Layouts. 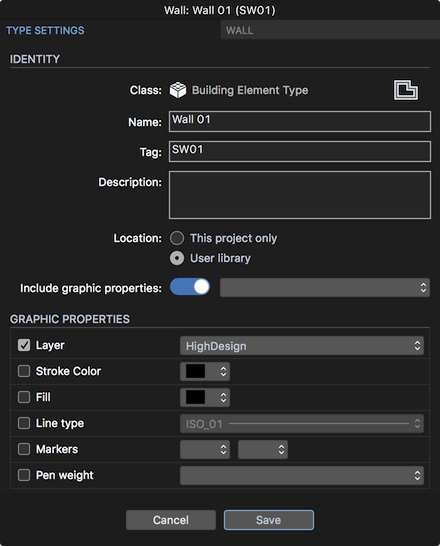 The new Project panel in HighDesign Pro. 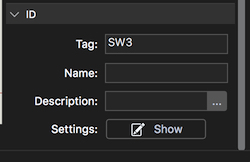 Building elements such as walls, doors, window and columns will include a tag that identifies each instance, as well as name and description. These data can be visualised by annotations and used as search criteria. The Object Info panel now includes metadata for building elements. Another important area of development are styles, which have been enhanced and more tightly integrated into the workflow. The users will be encouraged to work with standards and element types defined by their office or by the client rather than with custom settings. The new update will also include many more new features and improvements to the current functions, including an updated UI, DWG 2018 support and later this year SVG support. At the end of 2017, the development of the Windows version was merged with the Mac version so as to progress both platforms at the same pace and keep feature-parity as much as possible. We expect to ship the next update for both platforms before Summer 2018. For the “Architect” edition much work has already been done. It is planned for late Autumn 2018. That’s all for the moment! We hope you appreciate the news and the direction HighDesign has taken.